Waddle & Quack is a charming collection of eleven piano solos for beginning/elementary level piano students composed by Lynette Sawatsky. A teacher herself, Sawatsky put this book together with young students in mind and to provide some interesting and motivating repertoire. The songs were created in a variety of styles and are designed to be taught either by rote for elementary-level sight-readers or by imitating the teacher by ear. The clever lyrics are often an aid for learning the rhythms. I was surprised to see one piece in the key of B major (5 sharps) and another in F# (six sharps), but these pieces are played on the black keys only, simplifying what are often tricky key signatures and utilizing them in music that is fun to play. Grace notes, pedaling, hand cross-overs, glissandos, swing rhythm, repeats, 8va, and “body percussion” are all introduced in fun and easy-to-do ways. The book is illustrated throughout with beautiful black and white line drawings of the animals depicted in the pieces. Drawn by Deborah Alexander, the pictures could add an incentive for practice by either including coloring them as a “bonus” part of a student’s weekly practice or as a reward for completing each piece. The book also includes “Program Notes” in the back with insight into the intention of the pieces and clearly-written suggestions for teaching them. 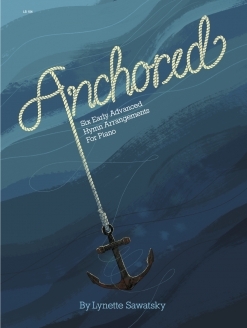 This book is a great supplement to a regular method book and is not just for entertainment since it introduces many elements of music that are usually presented later in a student’s development. That the music is fun to play is a wonderful bonus! 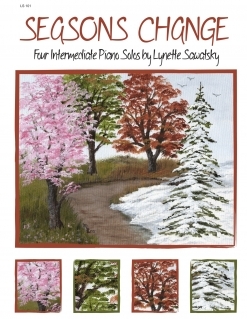 This is the second of Lynette Sawatsky’s books that I’ve reviewed so far, and I am very impressed. I have been teaching piano privately for 36 years, and am rarely thrilled with new teaching materials. What I have seen of Sawatsky’s books has been excellent, and I highly recommend them! 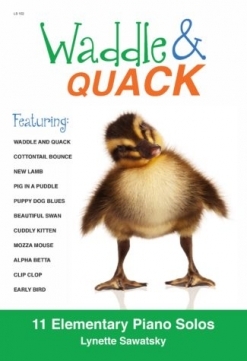 Waddle & Quack is available from www.DebraWanless.com and www.LynetteSawatsky.com.